The Lakeshore Nature Preserve places education—both for students and for members of the larger public—at the absolute center of its mission. Our mission statement declares that “the Preserve is as essential to the university as its lecture halls, laboratories, and playing fields.” Few universities in the world have such a rich and varied natural preserve so close to their central campus. There are many university programs that use the Preserve as an important part of their curricula, treating it as an extension of the classroom and research laboratory. Courses in many departments—Botany, Forestry, Geography, Landscape Architecture, Limnology, Zoology, the Nelson Institute for Environmental Studies, and others—use the Lakeshore Nature Preserve to study a wide variety of plant and animal communities. 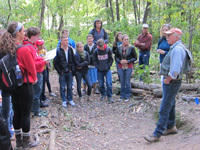 No natural area is closer to campus, or more fully integrated into the UW-Madison curriculum. Students and staff from Biocore’s Evolution, Ecology, and Genetics course are restoring an old field near Picnic Point to tallgrass prairie and monitoring its progress. Each new class of students is learning ecological principles and methods by contributing to multi-year research projects in the Biocore Prairie. F.H. King Students for Sustainable Agriculture is a UW-Madison organization dedicated to promoting sustainable agriculture. It operates a student farm situated north and west of the Eagle Heights Community Gardens. The garden contains fruits, vegetables, flowers, rotation crops, a composting area, and a small meeting/gathering space. The College of Agricultural and Life Sciences (CALS) operates research plots in the field north of the Eagle Heights Community Gardens and the F.H. King Student Farm. The soil pits, located in Bill’s Woods, are part of the Soil Science, Geography, and Geology curricula. In particular, introductory physical geography lab courses use these areas to demonstrate various soil horizons and soil types as a supplement to classroom and laboratory activities. These kilns are located at the south end of the old orchard field. 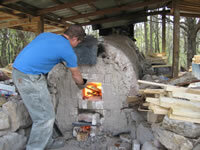 The art kilns are used by students and faculty to study traditional wood-fired methods of firing and glazing ceramics. The Anthropology department builds and fires a clay kiln each year as part of its Ancient Technology and Invention class. The Class of 1918 Marsh serves students and faculty in the Biocore, Landscape Architecture, and other departments as an example of a restored wetland. It is also an important birding area. Naval ROTC uses Picnic Point and its trail connections for training runs and navigation exercises. Army ROTC uses the Preserve for off-trail navigation exercises in the shrubby understory of Picnic Point Base and Frautschi Point. ROTC students also make significant contributions to restoration work in the Preserve as community service projects. Muir Woods has been used by students at Chadbourne Residential College and the Muir Woods Mentors student organization to do environmental community service work with Madison area schoolchildren. Because the long snaking corridor of the Lakeshore Nature Preserve is never very distant from any location on campus, virtually every part of it gets used for ad hoc educational exercises, especially those designed to get students out into the field to identify plants, study soils, observe wildlife, or think about human relationships with nature. Courses regularly do ecological field work in all corners of the Preserve, ranging from Muir Woods to Frautschi Point and beyond. Finally, it is worth noting that many UW-Madison courses whose curricula may not seem to be directly related to the physical resources of the Preserve significantly benefit from its amenities. For instance, English 100 classes, Geography 120, sections of introductory courses in the Nelson Institute, and environmental history discussion sections of History/Geography/ Environmental Studies 460 each year make use of the Preserve at one time or another. 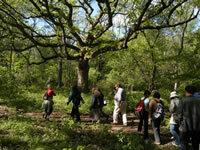 The Preserve staff offer numerous opportunities for members of the campus and surrounding community to volunteer to care for the Preserve, and the Friends of the Lakeshore Nature Preserve organization sponsors field trips designed to educate members of the general public about various aspects of the Preserve.